Bert and Linda started North Brunswick Electrical Contractors back in 1975 and have proudly served the Wilmington, Leland and surrounding areas with top quality and timely electrical contractor service ever since. The business is still family owned and operated by the Son (a licensed, professional electrical contractor) , and the Daughter, a professional Office Manager, Accountant, and experienced Project Coordinator. 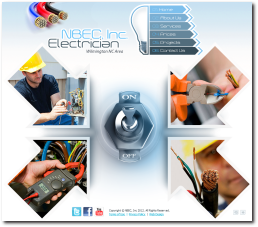 The news of North Brunswick Electrical Contractors product quality and, unparalleled friendly service, is well known in their ever expanding market community. The owner / operator pair came to me in 2012 to help them build an on-line presence and create an affordable Internet marketing program to help rev up both their commercial and new residential electrical contracting offerings. We built them a complete Web site with full animations, a catchy musical tune and a complete description of the company history, current service offerings and a very impressive list of past and current clients. We also created a full Google AdWords marketing program and through the magic of powerful SEO techniques, an organic (free) marketing engine that paid off in a very big way in less than thirty days! The VERY FIRST call that came in as a direct result of the new Web site, landed them a contract with an out of town commercial building contractor. With their construction crew on it’s way to Wilmington to build an entire apartment community, they needed a local electrical contractor to do the initial “pad” electrical. Using a search in Google, they found the NBEC site and called on the phone. That inquiry resulted in a contract that also has a potential to, in the future wire the buildings as well....13 buildings in total with multi-family capacity. So in simple terms, the first call paid for the entire Web site project ( with a lot of cash left over for a celebration party!) and may provide enough project work for an entire crew for a year or more. They are very pleased with the ROI on their Web site investment to say the least. The phone has continued to ring and other similar contracts have also been awarded, again because they were found on the Internet. The residential business is flourishing as well and NOW it is not unusual to get 2 or more service calls in a single day.